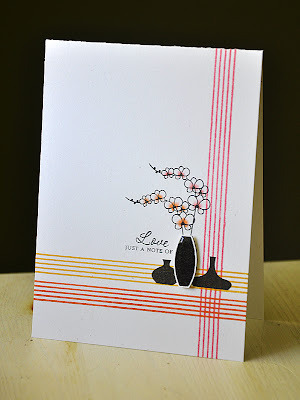 I'm so exited to be sharing in another Papertrey Ink anniversary celebration! PTI is celebrating 6 years of amazingness and I couldn't be more honored to have been apart of that since 2010. This last year has been a great one! There's nothing like getting to know and growing closer with a team of talented designers that all have a common love of stamping. First up, a card using Modern Basics. This card will always hold a special spot in my heart. Not only because it utilizes my very first stamp set, but also the fact that it's one of my most favorite one layer cards. I hand stamped the solid image repeatedly to create a super cool background pattern. I still love this pattern death! Even as much as I did when I first stamped it. The original post for this one is here. How about a little Gracious Vases simplicity?! I can clearly remember creating this card forever ago. It started with and idea in my head and it came to life exactly as I envisioned. This orchid image is still one of my top fave images designed by me. :) The touch of color to the centers just brings those blossoms to life. And if I remember correctly, this was around the start of my Glossy Accents kick. These stripes were always and still are a handy thing to have around, they're from the Background Basics: Retro stamp set. Original post here. 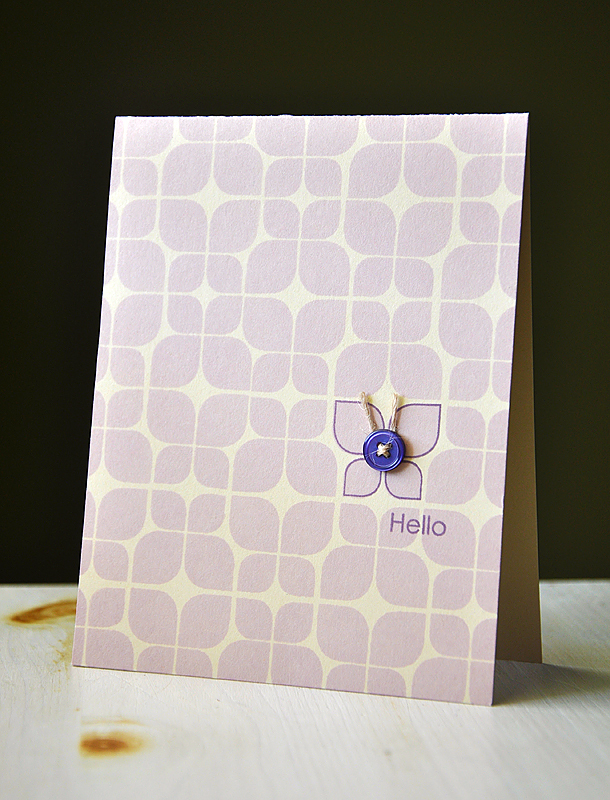 I just love how the colors pop on this Background Basics: Circles card. Color combo... berry sorbet, pure poppy, summer sunrise and true black (it's a good one). Oh... the days of the soft stone card bases. I go back and forth with this phase. 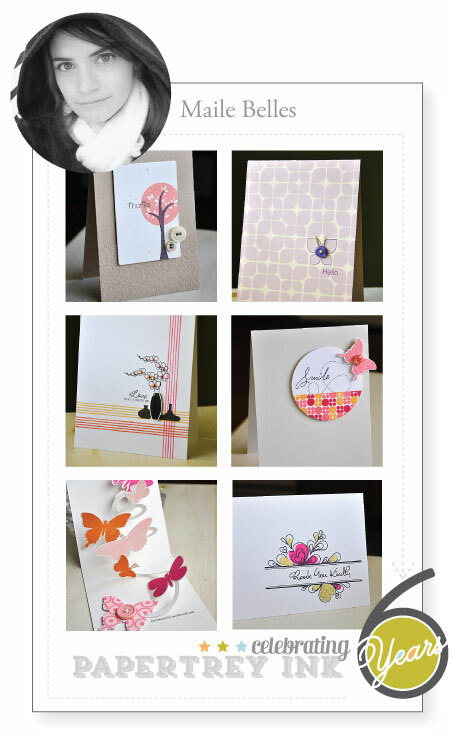 I think it might be time for me to start pulling that cardstock out again these days, I'm always a fan. 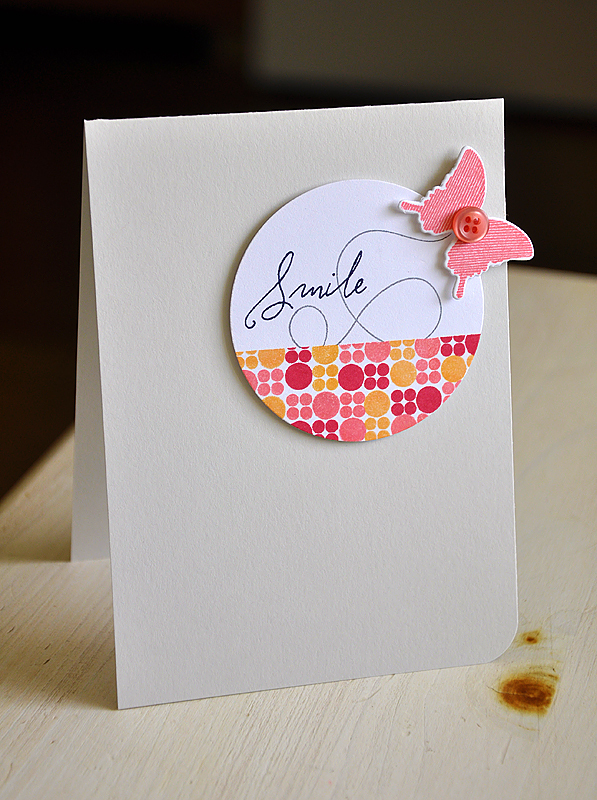 That pretty little butterfly, as well as the sentiment and swirly trail are from the Happy Trails set. I can remember the days when that set was a staple and reliably within an arms reach. It's still a keeper! :) Original post here. How about something a bit more dynamic. This card just makes me happy! Inside and out. Hmmmm... happy sigh. 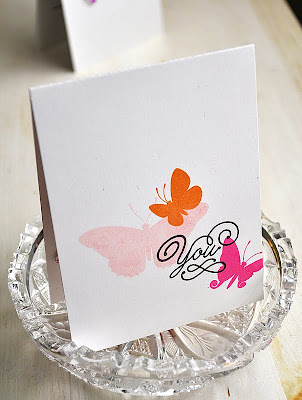 :) The butterflies, from the Beautiful Butterflies stamp set, were stamped in a fun color combo of sweet blush, raspberry fizz and orange zest. Check out the surprise inside. Such delightful movement, which was achieved using one of the Movers & Shakers dies. For some reason I can't get myself to give this one away, I just love it so. :) Original blog post here. Up next, Trendy Tree Tops. This may not appear to have a stand out appearance to many of you, but it sure does bring back a fond memory of falling in love with what I felt was a perfectly simple creation. 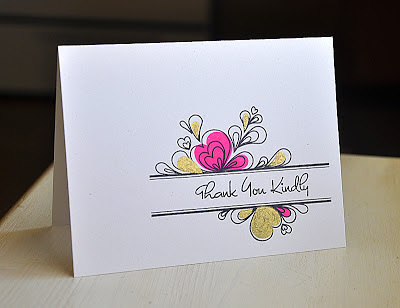 A card with a simple design but yet features little details that shine out and just speak to me. 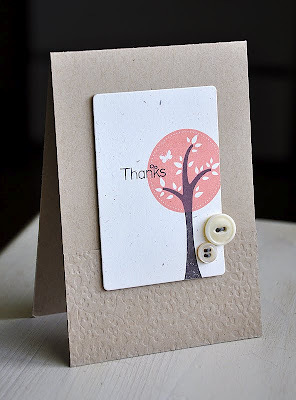 For example the simple impressed panel, or the matching buttons with contrasting thread (sort of opposite of the usual cream or white twine) and the simply stamped tree top in an unusual color, but some how it really works (stamped in berry sorbet with a smokey shadow grey trunk). And lastly, the sentiment stamped right next to the barley noticeable butterfly, it help to focus the eye on this easily overlooked detail. This card just speaks miles as to my style and who I am as a designer. Original blog post found here. Last but not least. This card expresses a couple of the trends I'm currently into... neon and metalics/gold. A simple yet stunning focal point was created by stamping one of the large images included in the Quilled Elegance set and filling it with neon pink and gold inks. It's so me. Yay! I hope you don't feel like i'm stalking you! I just love your style and creativity so it's hard not to tell you about it! Of your favorites today I pick the three in the middle. I love the way you grounded Gracious Vases on the BB:Retro stripes. The combo of BB:Circles with Happy Trails is just so great spotlighted in the simple circle popped up on the plain card base. 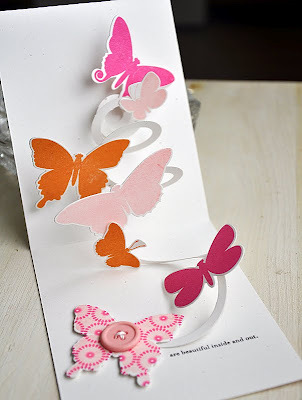 And the delightful way the butterflies take flight on this card reminds me of the butterfly release at the end of my daughter's wedding. What a beautiful card. Thanks for all the inspiration! Congratulations on another successful year at PTI! I love all of these! Your graphic style fits nicely with my style. I can't believe it, but I have made cards inspired by several of these! I love your style and I thank you for sharing your talent with us! When you joined the PTI team you brought an all new inspiration to my work desk. I look forward to see how you wow me each month. This is so fun to see as to which cards "speak" to you! All of them are so amazing! Love them all! Love your clean and simple style! Always look forward to every release to see what you and the DT have come up with! Thank you! Constantly inspired and surprised by your card and stamp designs--YAY, Maile! Your work is clean - but never simple! No one does clean and simple, which is really very difficult, better than you. I love your fantastic style. Thanks for sharing it all with us. 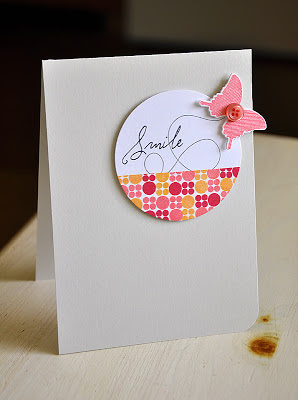 LOVE your simply stamped PTI style! Have a GREAT 2013! You have really inspired me to do clean and simple, and even when I think I won't like something, your projects always make me change my mind. Your cards are so beautiful yet simple...not in easy..but just simple, clean cards. Love it! I just love your CAS style! You always inspire me. Maile I just love how your cards are CAS!! I wish I could get mine a pretty as yours!! Looking forward to seeing what you have in store! Lovely simple lines. I have been trying more of these lately. I love the simple look, and have been doing simple lately. They are all beautiful...I so enjoy seeing what the design team comes up with, and fun to recap the past..makes me want to purchase them all over again!! Welcome back! Often the words "to cool" come to mind when isee you projects. Maile I'm so happy that you are part of the PTI Design Team. Both your stamp sets and design projects amaze me. Looking forward to more inspiration in the coming year. I think I have more of your stamp sets than any others--love your style! I recently started following your blog & I need a Pinterest board just for you since I keep pinning all your cards! Thanks for the inspiration! Great cards. Thank you for sharing with us on PTI this year. Love your work - simply stunning. Thanks for sharing your fave cards with us!